Transform your record-keeping by saving time, money, and paperwork. Our suite of tools can revolutionize your program. Streamline your program’s documentation process by bringing it all online. Time2Track makes it easy to go paperless with Online Hours Tracking, Online Supervisor Approval, Online Evaluations, and Online Forms Management － No Paper Required. With Time2Track Analytics, aggregate snapshots of your program’s practicum and internship training data are available in real-time. Quickly see a clear picture of the experiential training that your students are engaged in at any given time. You can then use these snapshots to shape and mold the quality of your students’ clinical training experiences, implementing changes immediately instead of waiting to see end-of-year reports. Until now, aspects of a program’s training goals have been difficult to quantify. With Time2Track, you can now quantify your students’ training experience in seconds by using the data stored in Time2Track. With Time2Track, you can monitor and control quality of training to make more informed, timely decisions. Use Time2Track Analytics to easily gather important data to prepare for annual reviews and meeting accreditation requirements while helping to significantly improve your program’s quality of training and outcomes. Save time and resources by obtaining data to support regional and national accreditation requirements － in just a few clicks. 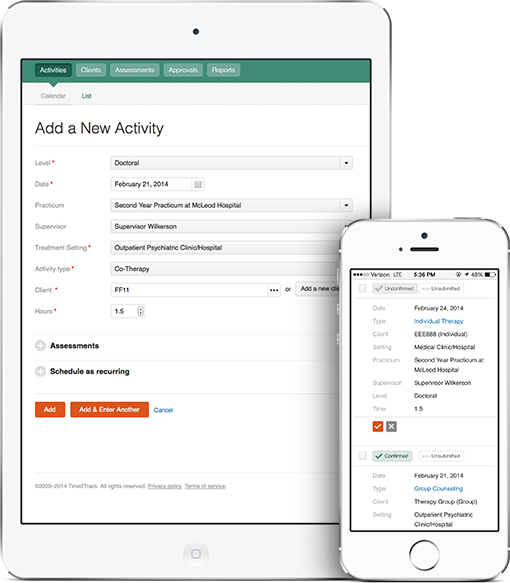 Time2Track has pre-built configuration options for every area of behavioral health, including Social Work, Clinical Psychology, Marriage and Family Therapy, Counseling, and School Psychology. Don’t see what you need? We’ll work with you to configure Time2Track to meet your program’s needs. Time2Track makes students’ lives easier, too, and they love the fact that they can pay for their own account after graduation. Time2Track makes it easy for them to keep all their hours in one place for licensure applications. Time2Track has proved efficient both in terms of cost and time for students and supervisors. The implementation of Time2Track transformed recordkeeping for our program and has earned the appreciation of our graduate students as well as supervisors. The benefits of Time2Track are instant in terms of immediate access to current hours and categories for comparison of earned hours. Students are excited that they can purchase an individual license after graduation for use in documenting hours toward full licensure. Technical help is always timely and courteous. I cannot imagine our documentation process without Time2Track! Our students are gradually embracing the Time2Track system for tracking their training hours. They find it much more intuitive and easier to work with than our original paper tracking system. And we find the summaries helpful to our assessment process for student progress.